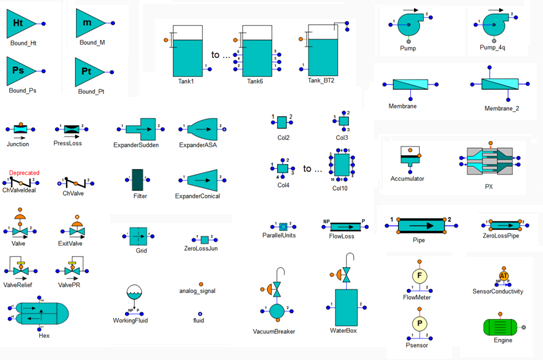 PIPELIQTRAN is a toolkit for the simulation of liquid pipe networks linked with controlled devices like valves, pumps, tanks, heat exchangers, osmotic membranes, etc. It has been developed and validated against experimental test results. The PIPELIQTRAN toolkit provides a palette of components (represented by symbols) that can be used to build graphically complex systems. Figure below shows the PIPELIQTRAN palette of symbols. This user case involves the fluid transient analyses in a circulating water system of a combined cycle power plant. 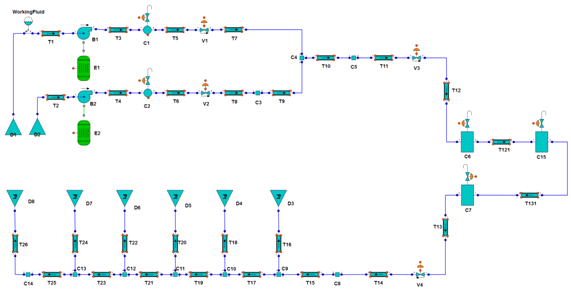 The schematic diagram of the simulation model is depicted in the following figure. The case consists of the sequential startup of both pumps with the system full. The purpose of this analysis is to check the correct opening time of the pump relief valves so that system pressures do not exceed the maximum allowable pressure. The opening time of the valves is 10 seconds. The relief valve of pump B1 starts to open at 20 s and that of pump B2 at 85 s. The first pump, B1, is connected during the first instant, whereas pump B2 is connected after 65 s. Vacuum breakers C1 and C2 have an initial air volume of approximately 5 m3. The following plots illustrate the evolution of the discharge pressures of both pumps and the mass flow circulating through them. EcosimPro and the PIPELIQTRAN library have been used to model a large reverse osmosis desalination plant with a maximum output of 16,000 m3/h . 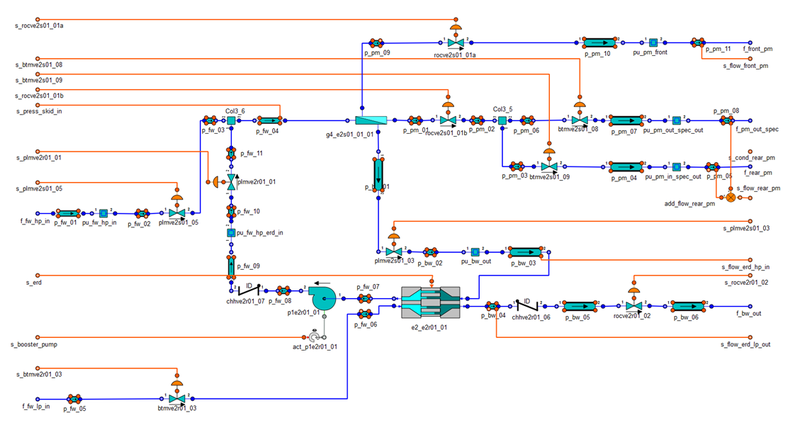 The simulation will allow startup and shutdown sequences to be studied with a view to guaranteeing plant stability. The plant is hydraulically complex for several reasons. First because the tanks between the various subsystems are not large enough, there is a strong hydraulic coupling between them. Second because the existence of several lines that operate in parallel, and where startup/shutdown of one of them can affect the stability of the others. The EcosimPro model includes the hydraulic modelling of the system to adjust design and control parameters, as well as to identify potential operating problems and to test proposed solutions. Hereafter is included the model schematic of the first desalination stage, as taken from the overall model where all the stages are interconnected so that their hydraulic coupling can be studied. 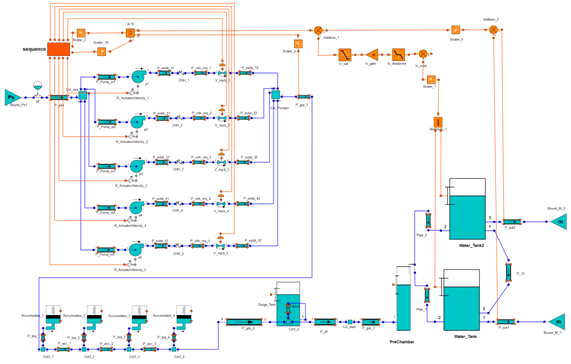 The model includes all the relevant components for the transient simulation of the Intake Pumping system, in particular, pipes, check and discharge valves, pumps, surge tank, accumulators, raw water tanks and overflowing pre-chamber for the correct simulation of the level behaviour. The model also includes the level and flow control loop of the system. The study has allowed to optimize the control and operational parameters (valve positions and pump speeds) and to confirm the design of the anti-waterhammer devices. 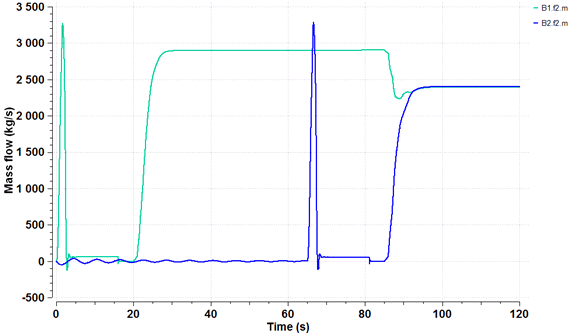 The results shown below correspond to the start-up sequence of the intake pumping system at summer ambient conditions. The following figure shows the upward sequence followed in this scenario. It has been considered that the mode changes every 2500 seconds . In some operation modes, the pumps are forced to operate close to their run-out curves for the maximum operating conditions. The levels in the raw water tanks remain within acceptable limits as shown below. 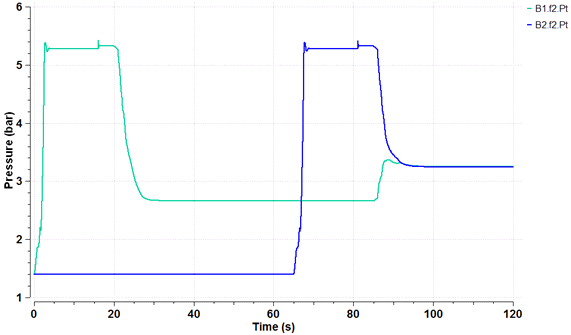 The oscillation of the tank levels throughout the startup sequence is less than 0.5 m.
The position of the discharge valves of the intake pumps considered in the start-up simulation scenario are depicted below. Finally the following figure shows the evolution of the total mass flow at different locations of the system (shore, before and after the surge tank) and the downstream demanded flow (p_from_uf).